Neat-sound programmable alarm is one of most bespoke and cost effective lines. A glass-filled nylon housing with electronics that provide exceptional durability and protection against moisture, dust and vibration. Intelligent models measure the ambient noise level and adjust their output level and create a volume that is safe without being annoying or contributing to noise pollution. Memory capacity is 3.95 MB. Instructions on how to programme ‘Neat-sound programmable alarm’. 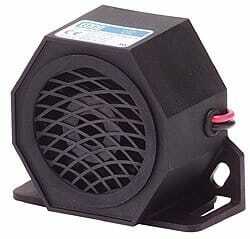 Police siren sound (off road use only).